Bunny Tails and Easter Egg Truffles are simple and easy to make. Shaping them and rolling the shapes in the coconut or sugar is a little on the time consuming side. But they are so darn cute, it’s worth it! My brother Jay and I would scarf down Mom’s shredded coconut stash as soon as we found the new hiding place. Maybe that’s why the younger ones in the family never learned to like coconut :=) More coconut for us – as in “none left”! Since not everybody is a fan of coconut for whatever the reason, half the mixture is made into colorful Easter Eggs. The moisture level varies among brands of cream cheese. I used Philadelphia cream cheese which is more moist than some of the store brands. The taste is the same, but pay attention when you add the last half of the powdered sugar. You may need less or more of the sugar to thicken the cream cheese depending on the brand. Keep the Bunny Tails and Easter Eggs small. They will be soft and may be a bit sticky, so keep a generous pinch of powdered sugar in a saucer or on a corner of the waxed paper to coat palms before rolling the candy. For the next game: Pin the Tail on the Bunny. Cut out the colorful tails, add double stick tape or rolled masking tape to the back and let the little ones take turns trying to get the tail close to its proper place. Cute and "fuzzy" little bunny tales with colorful Easter eggs with few ingredients add a fun note to a spring celebration! Simple make it yourself recipe if you are trying avoid candy additives. Using paddle on mixer, beat cream cheese until fluffy. Gradually add half the powdered sugar, then the flavoring. Continue adding powdered sugar and mixing thoroughly. Watch as you reach the last cup and stop adding when the mixture becomes thick. You have enough powdered sugar when you can form a soft ball with palms dipped in powdered sugar. Let mixture set about 10 minutes to set up and dry a bit, before shaping. 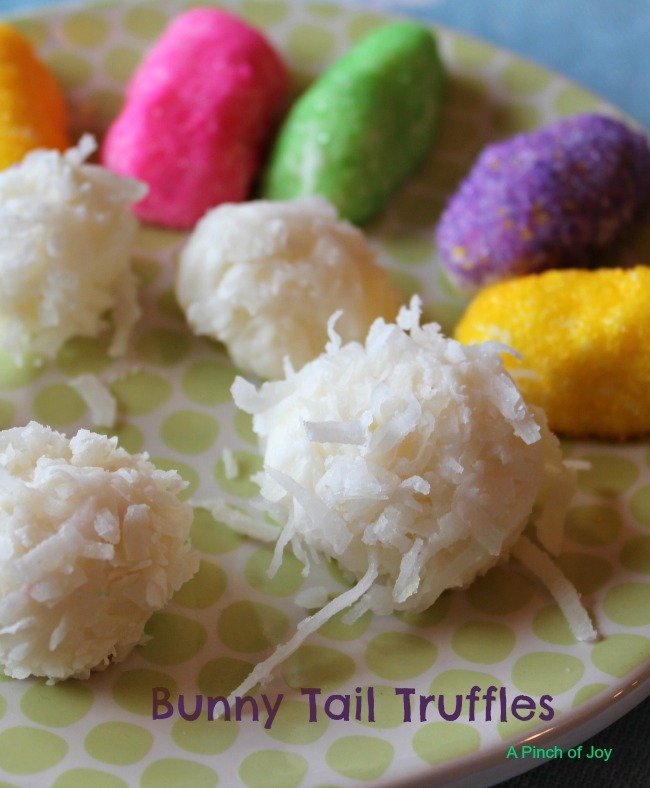 Form one inch balls and roll in coconut to make bunny tails. For Easter Egg Truffles, make a small egg shape and roll in colored sugar/sprinkles. Place on waxed or parchment paper and let set for 2 - 3 hours for the outside to dry.